Do followers of Sathya Sai Baba necessarily change for the better? Writings by and about Sathya Sai Baba are full of constantly repeated talk of ‘self-transformation’. 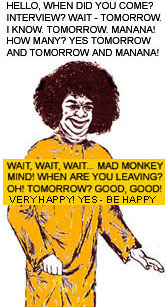 Effusive devotees praising and thanking Sathya Sai Baba for ‘transforming’ them into better people are naive and suspect. Self-transformation cannot be done for his followers by Sathya Sai Baba, it does not follow simply from joining his movement or organization nor from interventions in their lives like dreams or vague advice in interviews etc., which for nearly all of them is the most they could actually obtain. Because there is such an intense need for a sense of meaning in one’s life – something that is easily lost in calamity-struck societies like India – people seek all manner of ‘spiritual’ panaceas and comfort themselves that their contributions to a sect or cult will improve their own lot and hopefully those of others, and this demands belief in almost impossibly unrealistic hopes of transformation – even sudden world changes. It is a recognised psychological fact that personality change is a very long and arduous process, and is seldom very radical after long therapy. It does not simply follow from a change of beliefs, certain attitudes or a few lifestyle alterations, which is all that conversion to the Sathya Sai Baba doctrine can really offer. I have read most of extant literature up to 2000, over 300 books etc. and can say that the disparity between the ‘great changes’ most describe and what one encounters in practice in all Sai circles is very great. Most of the talk of personal transformation is either self-induced conviction, self-enhancing belief or even pure and simple personal propaganda to advance one’s interests in relation to the Sai movement and others. As observation of such charismatic conversions the world over indicate, one may have a change of mind without any corresponding improvement in behaviour. Rather, the converted all too often become moralizing, preaching, better-than-thou and less self-aware persons… the proverbial ‘God-botherer’. Religious feelings and prayers, rituals, devotional singing and worship (of gurus living or dead) is not the answer and never has been, as any student of human history learns early on. This is one of the most tendentious presentations ever of what critics of Sai Baba are claiming. It is simply not based on fact but fantasy. We who expose Sathya Sai Baba – having been deceived and our trust exploited by him to a huge degree – may despise and even loathe him, but without intense hate. Our work is for protecting a vulnerable public from the same dangers and in the interests of bringing forth the facts and the truth about them. Besides, there cannot be any serious forensic examination either of the murders issue or the sexual allegations, because all attempts have been blocked and terminated by authorities right up to the Prime Ministers and Presidents of India. Aitken falsely insinuates that there is no proof about Sai Baba’s sexual abuses, referring to the charges as ‘sexual innuendo’. Tell that to the BBC team who researched the matter across the globe and presented facts – invulnerable to all legal refutation, though Dr. M. Goldstein’s lawyers tried hard to stop the BBC, just as they have threatened other major media, which have refused to cave in. An extensive overview of the sexual allegations against Sai Baba, stretching back decades is found here, confounding Aitken’s false claim that we do not substantiate the charges we forward. Of course, Aitken has steered very clear of subject of the knife killings and the subsequent horrific execution of four intruders – devotees – in Sai Baba’s bedroom, and the subsequent cover-up by Sai Baba himself and all his supporters right up to the Home Minister and Prime Minister of India! Why does Aitken not study the considerable evidence of fraud – including calling ‘genuine diamonds’ what prove to be cheap synthetic gemstones, which he pretends to produce from thin air, like many other small, cheap objects he gives away (lingams, rosaries, bracelets, earrings)? For example, a number of watches donated by UK devotees for Sai students were later seen by the UK donors being ‘produced’ by Sai Baba’s sleight-of-hand. Leading devotees have testified to seeing stores of trinkets, rings, necklaces etc. in the seat of his chair in the interview room, including several Central Coordinators (who later left him) and a number of students and even some of his remaining devotees like the unscrupulous American apologist, Bon Giovanni! The list of such evidence, including videos, is long indeed. If he were honest about the truth, Aitken would read Conny Larsson’s searingly honest book (and a second here) about how he was sexually abused by Sai Baba under the pretense that he was ‘healing’ him, where two of the unstable youths in Larsson’s care who he took to Sai Baba for help were also allegedly abused (very credible circumstantial evidence of this), whereupon both took their own lives not long afterward! That was no ‘innuendo’. What of the four devotee young men who were murdered for trying to confront Sai Baba in his bedroom apartment with abuses… cold-blooded police executions on the orders of Sai Baba’s younger brother for which no one was ever charged or brought to justice! Comment: Does Aitken not know that the BBC is a national television company, hardly a “commercial broadcaster”? Of course he does… but he tries to make the BBC seem as “a mouse in Britain” and some kind of “Anglican” propagandist. The BBC is much more agnostic than that for certain! It has ever been and still is the most trusted world broadcaster, so Aitken’s outburst shows his blindly fanatical approach. See short clips and transcripts of the main parts of “The Secret Swami” and judge for yourself.